A discrete linear system is a digital implementation of a linear time-invariant system. Its input is a vector representing the sampled input signal (we will use x), its output is a vector of the same size as the input representing the sampled output signal (y). The system itself has to obey the usual conventions of linearity, particularly that it obeys the principle of superposition, so that f(a+b) = f(a) + f(b), where f() is the processing performed by the system and a and b are arbitrary signals. Linear time-invariant systems can be characterised in the frequency domain by their frequency response. The frequency response of a system tells us how a sinusoidal input is changed in magnitude and phase as a function of its frequency. Although it is possible to implement systems in the frequency domain, it is more typical to implement them in the time domain: sample by sample. To do this we use the time domain equivalent of the frequency response, known as the impulse response. A digital impulse response is just the sequence of values that emerge from a discrete system when a unit impulse is applied to the input (namely: x=[1 0 0 0 0 0 …]). To obtain the impulse response of a system specified in the frequency domain we can use an inverse Fourier transform to get a sampled impulse response then truncate or window the impulse response to a suitable length. The inverse Fourier transform is described in lecture 9.
generates a truncated impulse response in h of length n samples, corresponding to a low-pass filter with a cut-off at a normalised frequency w. In MATLAB filter design functions, frequencies are normalised to half the sampling rate, i.e. a normalised frequency of 0.5 corresponds to one quarter of the sampling rate (don't ask). Here we generate 1 second of white noise signal at 10,000 samples/sec and low-pass filter it at 2500Hz with a filter of size 100 samples. where w1 and w2 are the normalised frequencies of the band edges. In general you need truncated impulse responses that are long enough to capture the majority of the energy in the full impulse response. Filters with 100 coefficients are not uncommon. Filters with sharp edges need longer impulse responses. Finite impulse response filters have a number of good characteristics: they are simple to understand, have good phase response, and are always stable. However they are inefficient. Each output sample requires a convolution sum that is the size of the impulse response. That is for an impulse response of length N, the system implementation will require N multiply-add operations per output sample. Increased efficiency can be obtained by allowing the linear system calculation to use not only the current and past samples of the input signal, but also past samples from the output signal. Often the calculation performed by a linear system can be simplified if it can re-use some of the calculation that it performed on previous samples. This is called recursive system design, in contrast to finite impulse response filters which can be called non-recursive. Recursive systems are more complex to build, often have messy phase responses, and can be unstable. However they can be significantly more efficient and have impulses responses of infinite length. A recursive system is specified by two vectors a and b: the b coefficients are convolved with the current and past input samples, while the a coefficients are convolved with the past output samples. where as before, x is the input signal, y the output signal, and where b and a are the coefficients that define the recursive linear system. 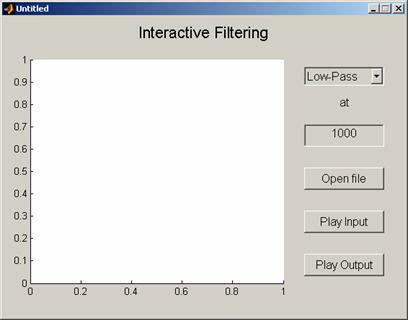 The MATLAB signal processing toolbox contains a number of different functions for deigning recursive low-pass, high-pass and band-pass filters. We shall only refer to one simple design, the Butterworth filter. This design generates filters with maximally flat responses in the pass band, although they may not have as steep a cut-off as other designs. Where n is the number of coefficients required in the filter, and w is the normalised cut-off frequency. Typically n is much smaller for recursive filters than for FIR filters, values of 10 to 20 are common. Here h stores the complex response and f stores the frequency indices. This book is highly recommended for the student wanting to understand DSP in more detail: P.A. Lynn, W. Fuerst, B. Thomas, "Introductory Digital Signal Processing with Computer Applications", John Wiley, 1997. For these exercises, use the editor window to enter your code, and save your answers to files under your account on the central server. When you save the files, give them the file extension of ".m". Run your programs from the command window. 1. Write a program (ex81.m) that asks the user for a filename (WAV file), then loads the file, low-pass filters it at 1000Hz and replays the original and the filtered version. 2. Write a program (ex82.m) that builds a low-pass filter, a high-pass filter and a band-pass filter and then plots their frequency response curves on the same graph. Use frequency edges of 1000 and 3000Hz and a sampling frequency of 10,000Hz. 3. Write a program (ex83.m) to compare the frequency responses of a 40 coefficient non-recursive implementation and a 20 coefficient recursive implementation of a low-pass filter at a normalised cut-off of one quarter of the sampling rate. Interpret the results.